If an assault weapons ban were still in effect this year, it is certain that fewer people would be dead in Las Vegas, argues Sen. Chris Murphy, D-Conn., a view that puts him at odds with one Democratic colleague who said no law could have been passed that could have stopped the Las Vegas gunman. Sen. Dianne Feinstein, D-Calif., asked by "Face the Nation" host John Dickerson Sunday whether any law passed could have prevented the massacre, replied, "No." "[Stephen Paddock] passed background checks registering for handguns and other weapons on multiple occasions," Feinstein said. 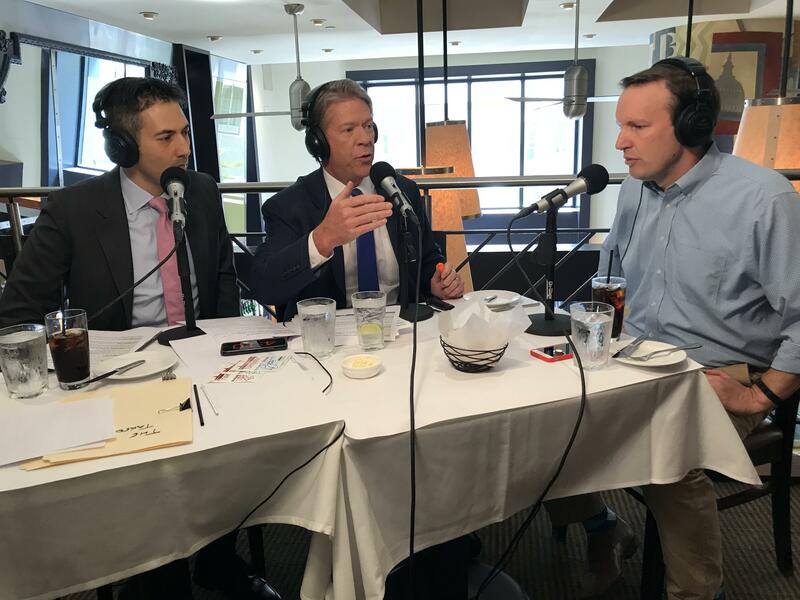 "I respectfully disagree with my colleague," Murphy told CBS News Chief White House Correspondent Major Garrett and Political Director Steve Chaggaris on the latest episode of "The Takeout" podcast. "It is correct that he would have passed a background check and he would have been able to own weapons," Murphy conceded of Paddock, who used semiautomatic firearms that were modified to fire like automatic weapons, when he killed nearly 60 people and injured more than 500 others in a matter of minutes at a country music concert Oct. 1. "But what if he did not have an assault weapon? What if the assault weapons ban still applied? What if he was up in that hotel with a pistol or a shot gun or a non-semi-automatic rifle? Maybe he would have gone through with the crime, but I guarantee you less people would be dead." The assault weapons ban signed by President Bill Clinton in 1994 prohibited 19 kinds of military-type assault weapons. It expired after 10 years, in 2004, but it's not clear that it helped reduce crime, given that loopholes in the law allowed gun manufacturers to make small alterations to features on the guns to bring them into compliance and put them back on the market. Murphy, who was the congressman representing Newtown, Connecticut, when a gunman killed 20 young children and 6 adults at Sandy Hook Elementary School there in December 2012, also believes that the types of weapons used in both Las Vegas and Newtown could have instructed the killers' motives. "I also think there's an interesting question about the kind of bizarre, perverse confidence that is given to a killer when they have tactical style machinery," he told podcast hosts CBS News Chief White House Correspondent Major Garrett and Political Director Steve Chaggaris. Murphy, who still regularly speaks with the parents and families of the Newtown children murdered in 2012, has spent the last five years examining what can be done to solve what he says has become a "uniquely American" problem. He says gun control advocacy groups like the Brady Campaign and Gabby Giffords' group Americans for Responsible Solutions have inadequately responded. "They haven't been effective and the Democratic Party was culpable in this respect. There was a mythology built up after 1994 that Democrats lost their seats because of their vote on the crime bill that included the assault weapons ban. I've looked at all the data and I'll tell you that's not the case." Murphy considers himself one of the younger members of his party looking to alter the Democrats' message in the coming years. Part of that, he says, is continuing to work on an entity that eventually grows to the size and influence of the NRA but counters the gun rights' groups message with an opposite one. "In 2016 we only had enough money and resources to really prioritize three or four senate seats and we win more than we lose when we prioritize, but we just can't make a playing field that's as big as the NRA," he said. "So until members actually fear losing their seat over voting against the 90 percent of constituents that actually want universal background checks, it's going to be tough sledding." While that may be one of Murphy's goals for 2020 – there's one thing he will not be doing – running for president. That, he says, he's ruled out. For more from Major and Steve's conversation with Murphy, including what meals caused them to "slide down the cholesterol abyss," download "The Takeout" podcast on Apple Podcasts, Google Play, Stitcher, or Spotify. New episodes are available every Friday morning.